Major League Soccer, North America’s premier soccer competition, is following in the foot-steps of several traditional sporting leagues before it to create the eMLS esports league for the competitive FIFA video game series. With an official partnership with EA Sports confirmed, MLS plans to have Canada and the USA’s best FIFA players represent their clubs on the digital football pitch in the lead-up to the planned FIFA eWorld Cup later this year. 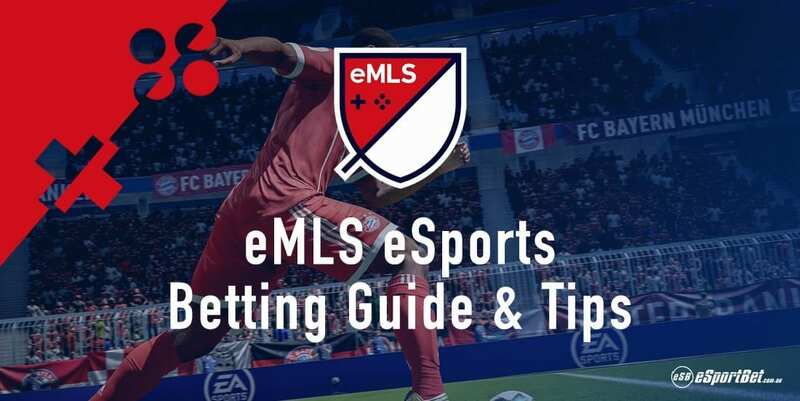 While details are still scarce, this page will cover how the MLS is structured, the schedule for the inaugural season, its playoff series, and which esports betting sites will offer betting markets on eMLS events. Keep us bookmarked for the latest eMLS updates. The eMLS is the e-League for Major League Soccer, North America’s major professional soccer league featuring the highest level of play in both the U.S. and Canada. The organization has partnered up with EA Sports, the developer and publisher of the annual FIFA franchise of video games, to create an esports league around high-level FIFA 18 competitive play. Players who participate in the eMLS will represent their favourite clubs in the EA Sports FIFA 18 Global Series Playoffs later this year, with the ultimate goal of reaching the Fifa eWorld Cup 2018 in August. The first season of the eMLS will kick off at PAX East in Boston, a North American popular gaming convention which will run this April. The exact structure of the league is as of yet unknown, but the PAX East event will determine the Canadian and North American qualifiers for this year’s FIFA 18 Global Series Playoffs. Which Major League Soccer teams are supporting the eMLS? Major League Soccer have confirmed 19 of the 23 clubs in the league have confirmed their participation and support for the upcoming eMLS on the outset, with the remainder expected to follow. The exact player selection process will be handled on a club-by-club basis, but it is known that each club can only select one professional FIFA player to represent them in the eMLS. Teams can have more than one player, but they can only ever send a single competitor to eMLS events. As for benefits, prize-pools and salaries, Major League Soccer has yet to confirm these details. However, it is expected players signed to the eMLS will be paid-full time and provided housing, bonuses and other benefits as is standard in other North American esports leagues, such as NBA 2K League and Overwatch League. Where can I bet on the eMLS and FIFA esports? The eMLS is still in the working stages, with more details planned to be announced further into the year. We fully expect the best online sportsbooks to offer odds and markets on eMLS tournaments as soon as they are scheduled and running, given the immense popularity of FIFA 18 and football in general around the globe. In the meantime, we highly advise checking out our reviews of the top-rated esports betting sites in the world, where you can wager on several other popular and niche esports tournaments for CS:GO, League of Legends, Overwatch and more. BetOnline: Licensed and regulated in Panama, BetOnline is our recommended esports betting site for North American pro gaming fans who want to bet on tournaments in Bitcoin or US Dollars (USD) safely. Read our official BetOnline.ag esports review for full details on payment methods and markets. Bovada: Bovada is another top-rated American esports betting site best suited for users who want to wager on esports events in Bitcoin and US Dollars. Read our full Bovada.lv esports review for more details. Pinnacle: Licensed and regulated by the Malta Gaming Authority, Pinnacle is a safe esports betting site for fans from Canada who want to bet on esports events in Canadian Dollars (CAD). Read our full review of Pinnacle’s esports betting options. Don’t know the basics of esports betting yet? We highly advise giving our beginner’s guide on how to bet on esports a read before putting down any of your money.